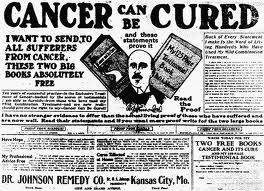 Suppressed by Scientists and Big Pharma: The Hidden Cancer Cure… But Which One?? Hulda Clark died of cancer?! I’m sorry if I seem a tad triumphant, I don’t mean to, honestly. But I just could not let this go. Unbelievable as it sounds, apparently überquack Hulda Clark died of cancer, multiple myeloma to be precise. Now how in the world can this have come about? Very rarely have alternative treatments or medication been able to show any therapeutic value. Yet countless people swear by it and are convinced they can’t do without. The mysterious placebo effect has everything to do with this. But what is it and how does it work? Harriet Hall explains. On April 15 we had a post on Jenny McCarthy claiming that HBOT (Hyperbaric Oxyen Therapy) is able to cure and prevent cancer. However, there is no evidence for this claim whatsoever. Other claims about alternative use of Hyperbaric Oxygen Therapy include that it helps patients with autism, but again, there is no scientific evidence to support these claims. Is there hope after all? Yesterday I received some e-mails. The first was from a lady whose mother is suffering from cancer. During her mother’s illness, this lady searched the internet for information on cancer and decided it would be a good idea to collect everything she found in one place. So she started a blog. The HBOT-chamber is not the only useless medical device that is palmed off on gullible people. Measured by the number of miracle cure contraptions that are sold to this day, the human capacity for fraud is indeed impressive. You can click here for a selection. HBOT – Hyberbaric Oxigen Therapy – is used to treat diseases for which decreased blood flow or a low oxygenation is major part of the problem and for which higher oxygen tension could help. HO is useful for a number of problems, but cancer is not one of them. However, Jenny McCarthy, never one to be daunted by the facts, on April 14 told the audience on the Ellen de Generes Show that HBOT chambers “prevent cancer.” She also advised people to buy one from a certain company. So please God, make this woman shut up. Pessimistic: it’s understandable why somebody might have thought of this. But if this actually works better than a placebo and a little human kindness, we are all going to have to make some major readjustments in how we think about health and disease. Don’t spend too much money, or get your hopes up. Magical thinking is the assumption that if I do this, then that will happen. It is an illogical thought pattern that involves linking unrelated actions or events. Things like emotional stress and events of great personal significance can push us toward magical meaning-making. Magical thinking is widespread and most of the time it’s harmless, such as the use of mascots in sports. But there is a tipping point, beyond which it can become quite sinister and even deadly. Is It True That Only 2 Or 3 % Of Cancer Patients Survive Chemotherapy? Tullio Simoncini's Lucrative Little Cancer Cure sCam?